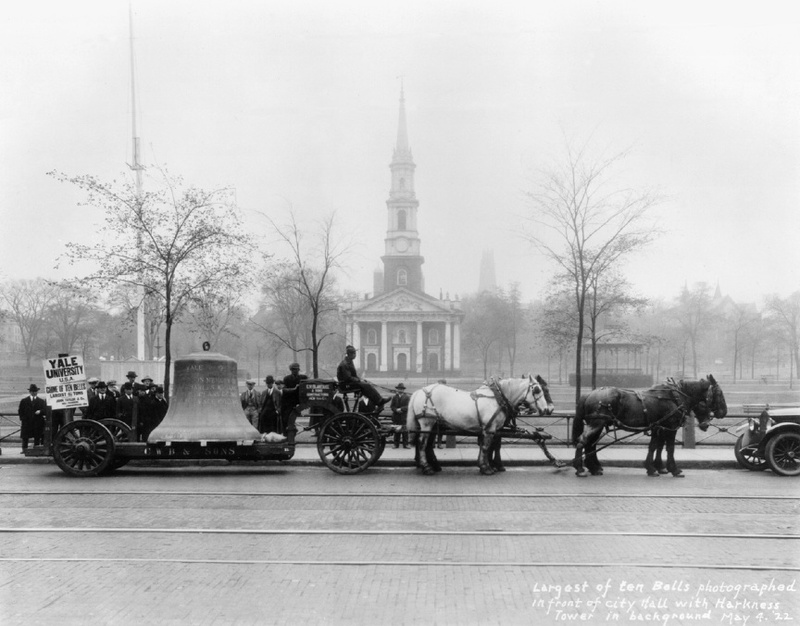 The bass bell of what became the Yale Memorial Carillon, on its way in 1922 past the New Haven Green. In the immediate background is Center Church on the Green, a Congregationalist parish established in 1639. The bell’s Yale destination, Harkness Tower, is visible in the background fog. This bell was cast by John Taylor & Co., in Loughborough, England. It is pitched at concert F-sharp and weighs 13,400 pounds. Credit: Yale University. If and when Yale University in New Haven, Connecticut, installs bells for change ringing at its new Pauli Murray College, the university will then begin to build a change-ringing band among its students, faculty, and staff. One of the surprising strengths that Yale will bring to this task is the scale of the university collections. For Yale is extraordinarily rich in museums. From several treasure houses of art and culture, Yale displays works that are themselves bells or that connect generally to bells or even specifically to change ringing. Consequently, when bells are eventually installed in Bass Tower, Yale’s future band of ringers will readily place their work within the larger history of bells and of ringing, and of art and architecture too. Yale’s Collection of Musical Instruments includes the Robyna Neilson Ketchum Collection of Bells, which likewise demonstrates the varied uses to which bells have been put across time and around the world. This show includes two bell objects. The older of the two, dating from the 13th century, is this bell with singha, or lion, from Java in Indonesia. Bell with Singha, 13th century, cast bronze (16.5 x 8 cm), Yale University Art Gallery, gift of Susan M. Yecies, B.A. 1971. This bell with singha may be particularly evocative for the ringers who are now planning to install change-ringing bells at St. Andrew’s Cathedral in Singapore, the Lion City. Their aim apparently is for those bells to be in place in time for Singapore’s 200th anniversary in August 2019. Also on view in Sights and Sounds is this bell in the form of a human head, made in Nigeria between the 13th and 15th centuries. Bell in the Form of a Human Head, 13th–15th century, copper alloy (20 x 13 x 8 cm), Yale University Art Gallery, Charles B. Benenson, B.A. 1933, Collection. The point of Sights and Sounds is that objects like these were used, by the cultures that created them, to make noise, and quite a lot of it. In this way, the exhibition seeks to undermine the Art Gallery’s silent solemnity. We ringers get this point; we know the sonic power of bells. As ringers we behold these objects understanding what they do. We bring the same understanding to objects of art that are not bells themselves, but that are emblematic of them. We view these objects too in a different way. While we look at them, we can almost hear them, synaesthetically. As change ringers, we ring in a tradition born in Britain. So consider the collection of the Yale Center for British Art. The Center holds more than 2,000 paintings, most of them given to Yale by one of Yale’s great philanthropists, Paul Mellon. And the Paul Mellon Collection includes several pictures that have obvious change-ringing associations. Most meaningful to ringers are three of the Center’s paintings by Giovanni Antonio Canal, better known as Canaletto—an 18th-century Venetian who painted city views, or vedute, in Italy and in London. Here from Yale’s Paul Mellon Collection is Canaletto’s mid–18th-century view of the west front of St. Paul’s Cathedral. The west front had been designed by Christopher Wren and completed less than 50 years earlier. This painting may not be quite to scale—it may minimize the vast size of St. Paul’s. But it also raises another question. Shouldn’t this picture have a soundtrack? Canaletto, 1697–1768, Venetian, active in Britain (1746–55), St. Paul's Cathedral, ca. 1754, Oil on canvas, Yale Center for British Art, Paul Mellon Collection. What may not be obvious to many viewers of this painting, but what is striking to ringers who have visited St. Paul’s, is that Canaletto chose to foreground the cathedral’s northwest tower, where Christopher Wren placed the belfry. In other words, to ringers, this painting is playing music. To ringers, although this painting is of a building, it may sound as though a hidden band is hard at work. The half-heard bells animate the architecture and give the painting a voice. In this way the Canaletto is like another work at the Center, The Sense of Hearing, which is more obviously about people making music together. Philippe Mercier, 1689 or 1691–1760, Franco-German, active in Britain (from 1716), The Sense of Hearing, 1744 to 1747, Oil on canvas, Yale Center for British Art, Paul Mellon Collection. What we hear now from the Canaletto is actually a musical anachronism. The Canaletto plays more varied music today than when Canaletto painted it, because a full ring of bells was apparently first installed at St. Paul’s only in the late nineteenth century. So the 12-bell music that we now hear from the cathedral’s west front is a Victorian addition. The ring of 12 bells at St. Paul’s is one of the heaviest rings in the world. They are rung by the St. Paul’s Cathedral Guild of Ringers, a highly skilled team. The Guild’s home page lists the bells (tenor 6,900 pounds) and their inscriptions. These bells, cast in 1878, were restored by the Taylors foundry this past fall. The cathedral has put up good photos of the Bishop of London, Sarah Mullally, blessing the bells in September before they were lifted back up to Wren’s belfry. 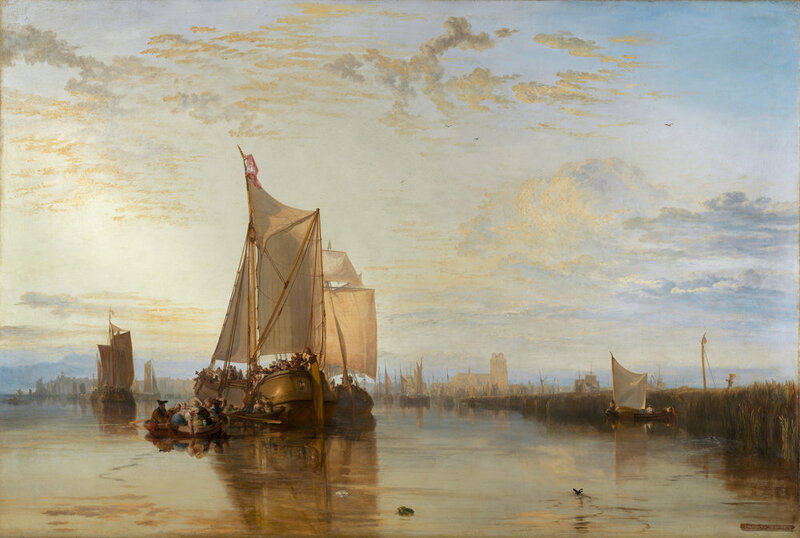 Two other paintings by Canaletto at the Yale Center for British Art are views along the Thames. The paintings in this pair capture much of London as a musical skyline. From his vantage point, looking upstream, Canaletto caught the towers of London’s other great church, Westminster Abbey, soaring high above the cityscape. Canaletto, 1697–1768, Venetian, active in Britain (1746–55), Westminster from Near the Terrace of Somerset House, ca. 1750, Oil on canvas, Yale Center for British Art, Paul Mellon Collection. According to the Abbey’s website, when Canaletto captured this view, the Abbey had six bells, two of which “dated from the sixteenth century and the reign of Queen Elizabeth I.” The ancientry of the Abbey bell installation proved problematic a century ago, “when ringing for the Armistice in 1918 was almost impossible due to the poor condition of the bell frame and fittings.” Two new bells were cast in 1919, expanding the ring to an eight (28 cwt). Then in 1971 a bequest enabled the Abbey to install a new ring of ten bells, which were cast at the Whitechapel Bell Foundry in London. It is these bells that are sometimes heard live, around the world, on great Abbey occasions such as the royal wedding in 2011. Perhaps most moving to ringers, however, is the third of Canaletto’s great London vedute that are at the Yale Center for British Art. For he painted the downstream view as well. And his view of the City, looking downriver from Somerset House, is extraordinary in several ways. First, it indicates the London skyline in the mid-18th century, dominated not only by St. Paul’s but also by many church towers. Nearly all of these towers would have contained bells. So the painting shows how Londoners could hear many towers, and might indeed have come to identify themselves (as Cockneys are still said to do) according to which tower was their neighbor. This music in this painting is multifarious—a clangorous cacophony from many towers. Canaletto, 1697–1768, Venetian, active in Britain (1746–55), The City from Near the Terrace of Somerset House, ca. 1750, Oil on canvas, Yale Center for British Art, Paul Mellon Collection. Second the picture reveals how Wren, Hawksmoor, and other English Baroque architects remade the London skyline after the Great Fire of 1666 (a catastrophe pictured in another YCBA painting). As a result, the skyline of London, at that time, was remarkably coherent; the vertical elements spoke with much the same architectural voice. Sadly, of course, at least to ringers, architects, and historians, many of the towers built after the fire were later demolished—some due to the Union of Benefices Act, others to make way for construction, and a few bombed in the Blitz and not rebuilt thereafter. Today, of course, many commercial skyscrapers now throng this view. Third, this Canaletto includes several bell towers that inspired Robert A.M. Stern Architects in designing Bass Tower. RAMSA’s book on Yale’s new colleges states specifically that the design was influenced in part by the towers of Cornhill, Limehouse, Spitalfields, and St. George in the East. These towers must all be in this picture: trees amid the steeple forest. Less certain is whether another painting at the Yale Center for British Art may have inspired RAMSA’s design of Pauli Murray College. For one of the paintings that Paul Mellon gave to Yale—a landscape that depicts a now-demolished country house in Kent—speaks volumes about Tudor architecture and church towers. Indeed this painting may encapsulate Dean Robert A.M. Stern’s design philosophy. Stern has described architecture is a “Janus-faced art”—an art that looks, like the Roman god of beginnings and endings, both backward and forward. Most art does this, one would think, in some measure; but Stern’s point is that because architecture is both public and permanent, it becomes a conversation across time, a dialogue among the generations who, each in turn, design parts of a built environment. Perhaps Jan van der Vaardt, 1647–1721, Dutch, active in Britain (from ca. 1674), Bifrons Park, Kent, between 1695 and 1705, Oil on canvas, Yale Center for British Art, Paul Mellon Collection. This particular painting probably caught Mellon’s eye because it includes horses and dogs. It suggests, if not a hunt in progress, then at least a pleasant ride through the countryside. Mellon was an equestrian and an avid collector of sporting art. The painter is uncertain: the Center’s official page on the painting suggests four different attributions, changing over time, and the title has changed as well. That said, the painting’s true subject is the house—and not just any house, but one called Bifrons Park. The word bifrons is Latin for “two-faced” and it was applied to this house because it symmetrically had two public fronts, two presentable facades. Yet bifrons was also a word applied to Janus, the two-faced god. So both the house and the painting carry the name of a deity that Stern claims as his own, in a design-philosophy sense. Note as well that Bifrons Park was built in a late Tudor or Jacobean style. So the house may stand for an architectural turning point between Gothic and neoclassical. Along with two physical fronts, the house had two art-historical faces, looking backward and forward. The style of Bifrons Park is also the style of Yale’s new colleges. So we might wonder whether this painting (and hence the historical memory of the house) may have, at least in part, influenced RAMSA’s design. Such artistic inspiration would truly make for a “conversation across time”—and across 3,500 miles of ocean, and across media as well. That kind of impetus from the painting—described in a 2011 video as one of the“treasures of Yale”—would serve as a subtle tribute to Mellon, who in addition to founding the Center for British Art also donated funds for two residential colleges that Yale built 50 years ago. 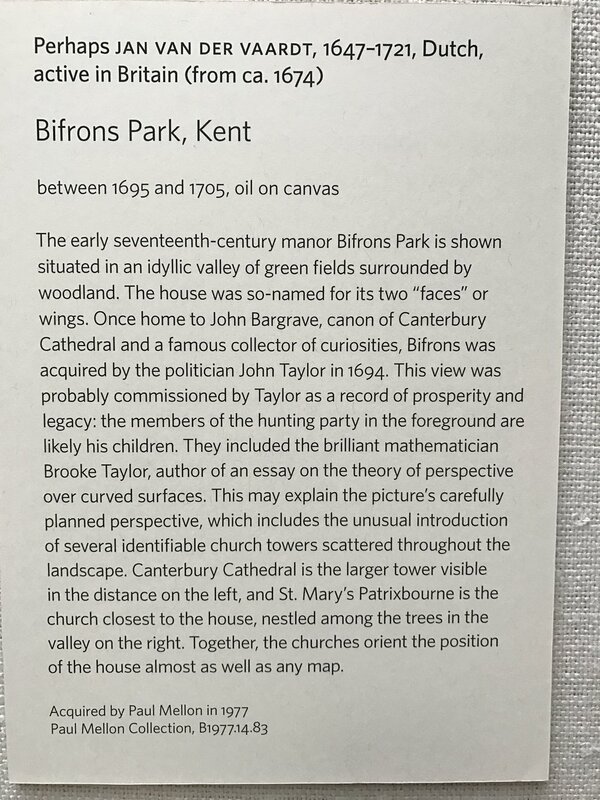 The Yale Center for British Art’s label for Bifrons Park, Kent, the painting shown above. Of the towers mentioned in the label, St. Mary’s Patrixbourne is listed in Dove’s guide as having only three bells today, and as being “unringable.” As ringers know, this designation is meant seriously: the tower is closed to ringing, perhaps because the bell fittings have deteriorated. But around 1700, when a local patron was mere furlongs away, the tower of St. Mary’s Patrixbourne would have been well looked after. Perhaps it was a source of music audible to the painter of this picture, perhaps even as he painted it. Of course Canterbury Cathedral, seat of the Archbishop, had then and has now a functioning bell tower—today, a 12-bell tower, the tenor of which weighs 34 hundredweight. The Bellboard database records dozens of recent ringing performances at Canterbury Cathedral. So Canaletto is not the only artist whose work at the Yale Center for British Art can be mined for campanological meanings. As a further addition to the list of Yale paintings that resonate with change ringing, we may soon include what may be the Center for British Art’s greatest work—J.M.W. Turner’s Dort or Dordrecht. This Turner is mostly a marine painting, and a glorious one. But it also includes a distant view of Dordrecht’s Grote Kerk. Joseph Mallord William Turner, 1775–1851, British, Dort or Dordrecht: The Dort packet-boat from Rotterdam becalmed, 1818, Oil on canvas, Yale Center for British Art, Paul Mellon Collection. This crystalline and luminous painting, truly a “treasure of Yale,” for years has occupied a fitting position at the Center—on the fourth floor, where natural light comes down through baffled skylights; and on the east wall, near a north window that permits indirect light to fall more where it should, on the left side of the picture. The result is a stunning painting in a stunning place. Yet Dort will soon have even more appeal. As if Turner’s use of gold and blue and bronze were not beautiful enough, it was recently announced that the Grote Kerk will soon house ten change-ringing bells. This announcement was made by the Keltek Trust, which specializes in removing bells from unringable towers and installing the bells in towers where they can be rung. The new installation at Dordrecht will certainly be rung: there is a very active local band, and British bands often visit from across the Channel. The Keltek Trust made its announcement on October 8, which happened to be the day before the 317th anniversary of the Connecticut colonial legislature granting a charter to establish what eventually became Yale University. (This year is the 300th year of Yale being called by that name.) This year is also the 200th anniversary of Turner’s Dort. He showed it at the Royal Academy in 1818. Such happy coincidences amplify a conversation across time and space in which architecture holds art, art speaks of bells, and—as the Nigerian bell suggests—bells resound in the mind. After Yale installs change-ringing bells, Yalies will listen to, and look anew at, many works of art. First published November 25, 2018; last revised December 9, 2018. Text copyright by Jeremy Bates.